The social committee is planning an event at the pool. Sandy and Larry Maun graciously opened their garage to the community for neighbors to gather. Beverages and snacks were served and a good time was had by all. Board members also took this opportunity to discuss with individuals the two By-Law amendments that will be voted on November 14. Our first attempt (June 4th) was rained out but we succesfully gathered the following Sunday. Grilled hotdogs (beef and meatless) with all the fixin's, chips and soft drinks were provided by THM. We had a great turn out with many new residents attending to socialize and meet the community. We also had lots of children enjoy the balloons and the beautiful blue pool water. We proudly installed an American flag and a TX State flag for this event. These flags were donated by a resident. A BIG thank you goes out to our Social Committee who planned, organized and helped during the event!!! Thanks also to residents who helped clean-up after the party. 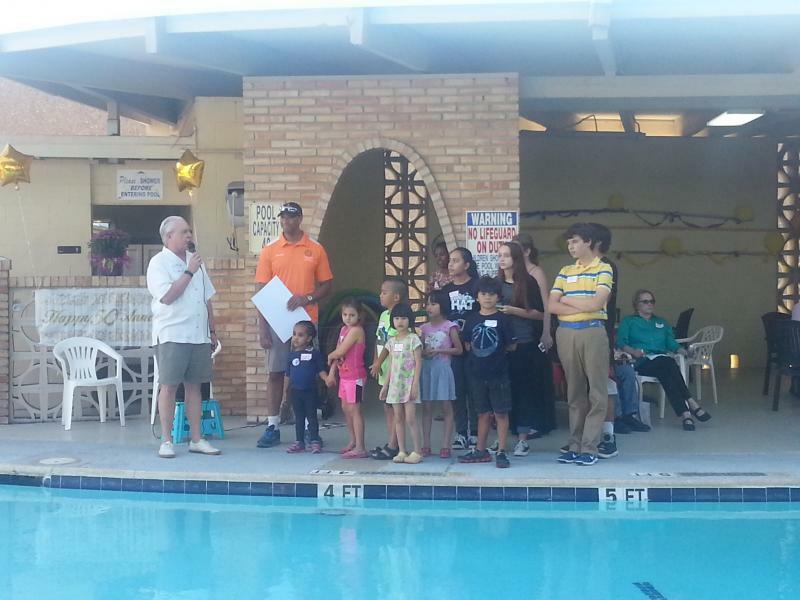 We gathered at the pool to celebrate our 51st Anniversary. Water and soft drinks were provided by THM and the community overwhelmed our buffet table with desserts, snacks and other favorite dishes. Music and games were enjoyed by all. The Forum was held at the pool 6:30-7:30 pm. Community Manager and the Board provided updates, and our residents asked questions. See you next time! Thank you to everyone who came to the social and brought food to share with their neighbors. The weather did not deter us from having a good time. A special thank you to our Community Manager and the members of the Pool and Social committees who made it happen. Our celebration was a huge success, with 130+ residents in attendance, having a great time with their neighbors, enjoying music and food. Donald Perkins from CM Green's office celebrated with us and presented a Declaration from the City (Mayor Annise Parker) declaring October 17th as Townhouse Manor Day.